If you have not heard of La Villette Paris, then you know very little about France and its magnificent capital Paris. Parc de la Villette is the largest urban green land in Paris. This place is filled with so much culture, magnificent architecture, different means of entertainment and green spaces that it seems unreal how is it possible to call it City Park. Parc de la Villette extends over 55 hectares in the northeastern part of the French capital, the place was once the former Parisian slaughterhouse for cattle. Parc de la Villette is a place where you can not bored. It is surrounded by romantic canals, everywhere you can come across interesting attractions around any of ten themed gardens of the park. The park reaches Boulevard Périphérique, an oval surrounding the Paris road. The park was designed by Bernard Tschumi, a French architect of Swiss origin. He works in construction on Parc de la Villette between 1984-1987, as part of urban design for the reconstruction of Paris. From that moment on, the place of the great Parisian slaughterhouse and the national market for wholesale meat appears one of the places for entertainment and recreation of Paris. Today Parc de la Villette brings together a large number of public facilities related to science and art, playgrounds and a whopping 35 buildings, which can be defined as architectural follies (in the positive sense). 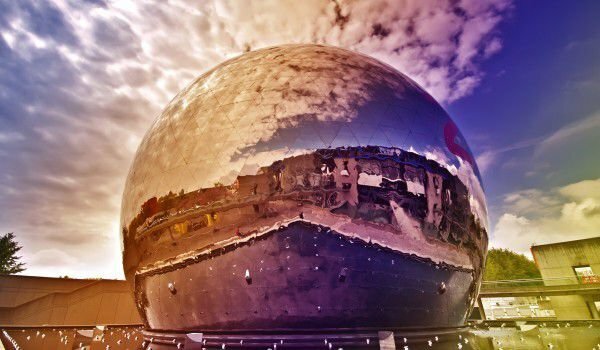 Here visitors can see The Cité des Sciences et de l'Industrie, which is the largest science museum in Europe. It is located in the periphery of Parc de la Villette. The main purpose of this museum is to educate the scientific and technical culture in people and to promote interest in science, research and industry. You'll know its Bioclimatic museum facade and great interest from visitors - over five million people annually attend the scientific exposures of Parc de la Villette. Parc de la Villette has long been a popular place to host a number of activities that engage all people of all ages and cultural backgrounds. The uniqueness of this place comes from the fact that it plays the role of a modern conglomerate of cultural self-expression and self-identification of many French artists and musicians. Continuously the gardens host different exhibitions and performances, even film festivals are held outdoors. 35 whimsical steel structures around Parc de la Villette are probably the biggest distinguishing characteristic of this place. Actually, they are made with the idea to serve something like orientation to visitors and direct them to different places in the gardens. In recent years some of these buildings were refurbished and converted into restaurants, In the data center and other places associated with meeting the needs of people Parc de la Villette. 10 thematic gardens of Paris Park amaze with their weird installations and sculptures. Each garden has been built so as to play with space through the unusual and strange statues. One of these gardens in Parc de la Villette is the Garden of the Dragon, where you can see a 80 feet high steel structure, representing a dragon. It also has a slide for children. In Parc de la Villette is the popular Zenith rock concert hall, Cite de la Musique, which is an intriguing museum of musical instruments, and Paris National School of Music.